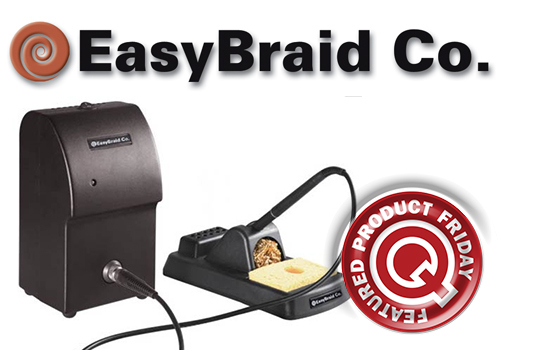 Save 21% off the MSRP on EasyBraid’s EB-5000S-1 Soldering Iron System 100-110 VAC Complete System (Q Source SKU: EB-5000S-1-E012) when you use our FPF050815 Coupon Code. This Featured Product Friday (FPF) promo is valid from today, May 8, 2015 through Sunday, May 10, 2015. This EasyBraid Soldering Iron System features technology designed to keep tip temperatures accurate and consistent based on characteristics of a metal losing its magnetic properties at specific temperatures. Regularly listed at $492.31, but with our FPF code savings you’ll get it for just $389.00. While this is a 3-day limited-time price, the coupon is unlimited. Use the code as many times as you like while it is valid—and please feel free to share the code with your friends and colleagues. Each week, we promote our FPF selection on The Q Source Resource Blog, via our email newsletter, and via our social media accounts. We encourage our valued customers to subscribe to those resources and to visit QSource.com on a regular basis for the latest FPF offers (look out for our FPF logo). Please help us spread the word about Featured Product Friday. For further questions about Featured Product Friday, please read our informational blog post, call us (800-966-6020), or send us an email. Please note: This promo is valid only at QSource.com and expires on May 10, 2015. How Do You Entertain a Bored Robot?